That’s 75 mouths to feed and 9 water bowls to keep filled. Not to mention kiddie pools and improvised puddles for the baby waterfowl. Last year’s census was high and I said I wouldn’t do it again this year. Yeah, right. It won’t be this way for long. The Red Rangers are on their way to freezer by Fourth of July. If Bonus acquires some manners and the hens are well-disposed, he will move into the layer coop for the time being. The turkeys will summer down on the Bluebird orchard, providing essential grasshopper control until their date with destiny in the fall. The fate of the geese is up for debate. I said to R last night, they are the right bird for us in five years. Yes, they are obnoxiously assertive and loud, but we knew that getting into it. If they were in Bluebird, that might even be a feature. They are also stately and convert grass into soil fertility as non-stop mowing machines. I love watching them play in their kiddie pool and swim in the irrigation canal. But we need them in the orchard, and they love the taste of young sapling bark. After they girdled a few young trees, they were ousted from where we need them the most. 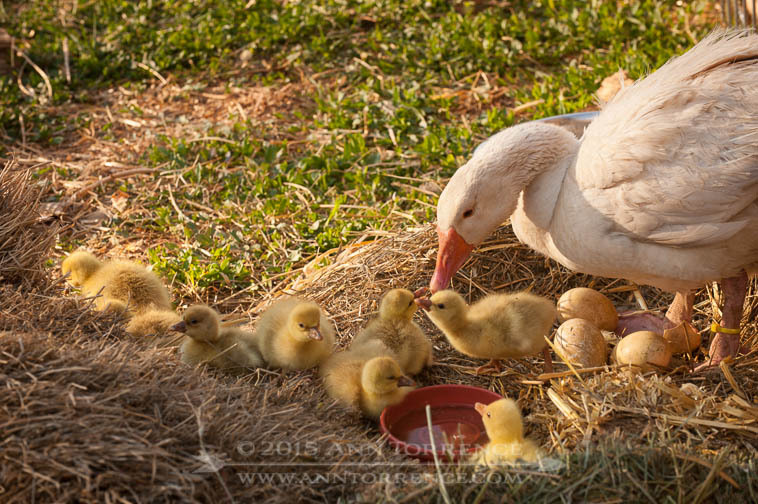 The ducks are an experiment to see if they can fill the niche of the geese and the laying hens. We happily discovered this spring that we preferred the taste of goose to chicken eggs. If the duck eggs are similar, we’d score that as a win. The duck literature suggests they will lay more, lay better in the winter, and for a longer lifespan than the hens. And they lay at night, which means reliably in their shed. The damn hens are up to their trick of hiding eggs again in the orchard. What we don’t know is if the ducks will perform pest control as well as the hens, and how destructive they are. We are hoping they live up to their reputations because they are terribly fun animals to have around. Turkeys are a different experiment that is going better than expected. The Bluebird orchard is 3 acres of grasshopper haven right now. We’d need close to 50 chickens to patrol that amount of ground, and they really only do that for a few weeks, between the brooding and the harvest time, because they’d have to be meat birds-we don’t have room wintering over 50 more chickens. Turkeys seemed a better fit: they will forage well, grow slower, harvest when it’s cooler and easier work, and I prefer to eat turkey anyway. With some trepidation, as all the book-reading says they are really hard to get to survive the brooding phase, I ordered a Thanksgiving weekend special (not joking, you have to reserve heritage birds early) last fall. We lost 4 of 17, which I gather is not terribly by turkey standards, although my goal is 0. Now that they are out and exploring their world, they seem pretty robust. The one concern is that turkeys can catch a nasty protozoan from chickens which gives them Blackhead disease. For chickens it’s not much of a problem but is deadly bad news for turkeys. Supposedly it takes 3-4 years to clear the land of the protozoan eggs, although earthworms can be a vector. Bluebird hasn’t had any chickens on it at all. Right now, we have the turkeys on a patch right outside the front door that was lightly trafficked by the meat birds over the last year, but it’s not pristine. And who knows how far earthworms travel? We are crossing our fingers and have some treatment on order just in case. Then, surprising us all, Yellow Girl hatched her nestlings a week ago. We have been struck by 1) how healthy her chicks are, 2) how she’s doing 95% of the work of raising them, and 3) how they are eating mostly free grass. Every time we get chicks out of the brooder and onto real ground, they explode with vitality. Maybe it’s the sunlight and fresh air, or maybe it’s getting to express all of the instinctive behaviors, or maybe it’s the contact with the microbial biome. I have no idea why, but real ground matters and we try to get them out as quickly as possible. This spring has been colder and wetter than normal and we’ve had the birds in the brooders much longer than I like. Not the goslings-they’ve been out with Yellow Girl since day one. So where this is going, if we like working with these animals, is that we will select “our” homestead turkey and duck heritage breeds, let them do their natural breeding to maintain the flocks, re-home the geese, and let natural attrition reduce the layer hens to zero. I say I can let the geese go, obnoxious bullies that they are, but I still kind of like them. And then there’s Red, our first hen that’s kind of a pet. And Bonus, who is going to be useless but strikingly beautiful. Will practicality prevail? It hasn’t so far. But the winter reality is that keeping water from turning to ice in 9 bowls is absurd, so something will have to give. I’m holding off the decision until fall-possibly the day after Thanksgiving.